It’s hard to say whether Jorge Luis Borges would have lived life differently if he thought he had a choice. In the same 1964 collection that our poem comes from he wrote a poem about Emerson, whom Borges long claimed to admire for being an intellectual poet. The poem describes Emerson closing a book, and walking out into the fields at evening where he contemplates his life. (Camina por los campos como ahora / Por la memoria de quien esto escribe. He walks through the fields as now through the memory of the one who writes this.) He realizes that he knows as much as god gives anyone to know and that he is renowned throughout North America. It ends: “No he vivido. Quisiera ser otro hombre.” (I have not lived. Would that I were another.) Of course Emerson was Borges’s literary alter ego. That much is clear by the way he praises Emerson elsewhere. Having a literary alter ego in some small way allows you to be another. But does the poem about his alter ego mean that he, Borges, regretted the way he lived his life? Or was it simply another intellectual game of Borges, a pose. After all, the collection was called El otro, el mismo—”The Other, the Self” or “The Other, the Same” (pdf file). Borges, on the other hand, remembered that the most important thing in his life was his father’s library. Books, words purposely arranged, meant more to him than diversion or an occupation. He believed they had a life of their own. Their reality was at least as important as material reality. He said that his own words, once uttered or written, had their own lives unrelated to him. As for major events in his life, they were few. He contemplated suicide, or at least dallied with the thought of it, when he was rejected by a woman in 1934. He would casually refer to his suicidal thoughts when he attended conferences on his works in universities late in his life. He had a great hatred for and opposition to Juan Perón. The aspect of Peronists that Borges particularly despised were their populist anti-intellectualism. Professors and other intellectuals were dismissed in droves when Perón first came to power after World War II, but Borges was fired from his municipal library position in an especially humiliating way: he was “promoted” to the position of local inspector of poultry. When a coup deposed Perón in 1955, Borges was named head of the Biblioteca Nacional de la República Argentina. 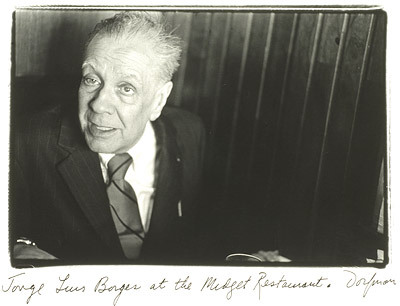 (Borges was internationally famous, and his appointment was part payment for bringing international condemnation on the Peronists.) The position could not have been more fitting for Borges. Unfortunately the appointment coincided with the stage of his blindness when he stopped being able to do new reading. When Perón returned in 1973, he resigned the post. Or perhaps the shock of Perón’s return changed him. The anti-Falangist, anti-Nazi descendant of Argentine Radicals became conservative, even anti-democratic. When the term of Perón’s widow, Isabel, was ended by a golpe de estado, Borges accepted the new right-wing dictators who followed her, even provided intellectual cover for them, despite that the Dirty War profoundly shocked and revolted him. By this time he was entering his late 70s and was more of a literary prophet, the blind Tiresias, accepting accolades in Argentina and Europe and America, going from university to university, saying the same cryptic, perhaps meaningless, observations. His offhand, nonresponsive answers, repeated from interview, to symposium, to literary “conversation,” were forgiven because he was genuinely affable, with a self-negating manner, and he was, after all, blind. Two decades before that he was still producing dreams for others. His dreams often involved, as does our poem today, the secret rules which govern our course and fix our choices. It was an expansion of a short poem (by the same name) in El hacedor (1960), a meditation on a line by Verlaine that he doesn’t recall: “Hay una línea de Verlaine que no volveré a recordar.” (There is a line of Verlaine that I will not remember.) The mirror in that poem is one that Borges, approaching 50, will not see. The last line is less whistful: “la muerte me desgasta, incesante” (death wears me down, incessantly). Some have suggested that the poem has to do with the blindness of Borges. But it cannot be so, because the vision is so perfectly visible to each of us. Sin saberlo, no hemos despedido? Espcio y tiempo y Borges ya me dejan. Which unravel and weave this life. Without knowing it, we have bid farewell? There will be some which I will never read. As if it were a lithograph. But Janus, four-faced, guards them. By either the white sun or the yellow moon. You wish to say unforgettable things. All that yesterday on which today I incline? Which with fire and salt the Latins wiped out. Space and time and Borges now leave me. Renaissance Humanism comes to English letters: Wyatt, "I am as I am"
All ads that appear here are selected and inserted by Wordpress.com for its sole benefit.